Please ask for our monthly special offer when booking your MAJOR SERVICE. Service prices remain the same starting at £220 for a minor and £299 for a major for most models. 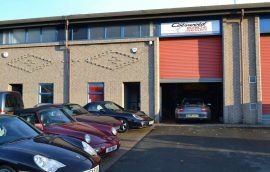 Here at Cotswold Porsche Specialists, we are dedicated to keeping your Porsche on the road for less; we offer expert advice, fantastic workshop facilities, great value used Porsche spares, and a selection of hand-picked, used Porsches for sale. Servicing is done in our well-equipped workshop which has the latest diagnostic tools for Porsches. Our mechanics have over 25 years experience and are well accustomed to Porsche models old and new. If you bring your car to us, you can be assured it is in excellent hands. 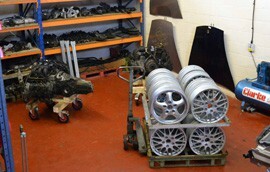 As well as an extensive supply of used genuine Porsche parts, we are able to supply new OEM and OE parts. The OEM parts can offer fantastic savings over OE and are the same part without the Porsche part number or price tag. We ask that you please call ahead to arrange a visit. We hope you enjoy our website. If you can’t find what you’re after, then call us for a chat. We might have just what you're looking for. Otherwise drop by. We are based in the North Cotswolds, less than an hour away from Bristol, Coventry, Birmingham, South Wales, Oxford, Swindon and only 90 minutes away from London. For servicing, we have a well-equipped workshop with the latest diagnostic tools for Porsches. We have over 25 years experience and a detailed knowledge of all Porsche models -old and new. If you bring your car to us, you can be assured it is in excellent hands. All our repairs and servicing are carried out with original equipment (OE) quality parts, whether it be oil and filter change through to a major engine overhaul. If you are looking to buy a Porsche, we normally hold a stock of quality, hand-picked vehicles. Before sale all our vehicles will have undergone a rigorous inspection check - so you can take the risk out of buying a used Porsche. Our aim is to help keep your Porsche on the road for less. We achieve this through great prices for spares, whether new or used, low labour rates and an excellent mechanic. As well as an extensive supply of used genuine Porsche parts, we are able to supply new OEM and OE parts offering you fantastic savings. If you are looking to buy or sell a used Porsche, then we can help. We have a stock of quality, hand-picked vehicles ready for you to come and see. 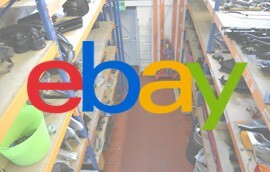 We always carry a huge range of used genuine Porsche parts ready to go, why not visit our eBay store to see what we’ve got in stock. I would like to thank you, Lynsey and the team for the way we were made to feel very welcome at Cotswold Porsche, for the lift to and from Broadway and the great Service on the Porsche. I did get the revs up on our return journey and noticed a big improvement in the cars performance. WOW. Thank you again for all your help and advice. Fitted new cluster which solved all my issues many thanks for the prompt and efficient standard of service and customer care. Having been advised I might need a new AC Compressor (£418.74+VAT), Cotswold Porsche Specialists offered me a used unit (£40 inc 30 day Guarantee). On visiting CPS they found out all the car needed was a re gassed! I cannot praise this company enough. Thanks to Lee and his team for their hard work and focus on delivering to their promises and their original quote. I will definitely consider CPS for future work, be it big or small jobs and I thoroughly recommend others do the same. 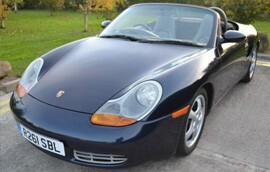 I received a great service from Lee and the guys at Cotswold Porsche Specialists and can totally recommend them. Very decent people who are passionate about their business. Excellent mechanic with eagle eye on inspections and detailed diagnostic reports with face to face explanations. Ability to courier in parts and get stuff done on the day. Welcoming business with broadband wifi available and great cafe across the road if you want to wait. Honest, quality workmanship and advice at an unbeatable prices. Well done, my car has a new registered GP! Much sharper engine, lighter clutch and silky gear changes – its just asking me to go quicker now! In fact its like it was when I first picked it up 14 months ago. Thank you – worth every bean! Just wanted to drop you a quick note. What drive home that was! I went cross country A and B roads and it was an absolute joy. I was expecting it to go round corners better (which it does), but more noticeable was the change in braking and acceleration. Lastly, I guess one of those things when you drive a car everyday, I hadn’t noticed any degradation in power (or delivery of it). But cleaning the MAF feels like the car has been remapped! The power delivery is so much better, I don’t think it has ever felt as good from the day I owned it. It honestly feels like it has another 50 horses! Just wanted to let you know that the car made it through the roadtrip beautifully. 5000 miles later, I’m back in the uk! Just wanted to say a big thank you for all of your help that’s the best the car has gone thanks again will be in touch soon. Dad is over the moon too. I’m over the moon with the car, it’s an absolute joy again thanks to you. The car feels far better than when I bought it 5 years ago. It’s like having a new car, I will now hang on to it for quite a while! Thank you very much for overseeing the “project”, I really appreciate your fantastic expertise but above all your friendly and helpful manner – it was a pleasure dealing with you and I now feel very confident to own “old” Porsches in future with you guys on my doorstep. “Over recent weeks I have been drip-feeding CPS what must be irritatingly small orders for obscure parts as I refurb my 964. Without exception, the orders have been turned around at great speed and my occasional errors and frequent queries dealt with faultlessly. They have also worked on tricky service issues with my 996 with systematic solutions and appropriate, timely communications. It was great to meet with you yesterday. I was very impressed with your customer service and company philosophy. I have no doubts that I will use your services for many years to come. Well worth the journey. I spoke to a lot of Porsche Service Centres and the passion, professionalism and honesty came through loud and clear when talking to you. It is very reassuring to know that I have you on my side and can therefore be sure that the maintenance of my 996 will be to the highest standards without unnecessary work or costs. I look forward to my next visit (assuming the circumstances are good!!). © Copyright 2015 Cotswold Porsche Specialists Ltd.